Tackling obesity has now become a growing problem both from a national and an individual level. Firstly, from a financial point of view, the estimated cost to the NHS of obesity is over £6 billion. More importantly, from an individual perspective, the impact of obesity can have a myriad of different negative effects. People who are obese are more likely to have heart disease, strokes, diabetes, cancer, and depression. At the start of National Obesity Awareness week, we take a close look at the problem. 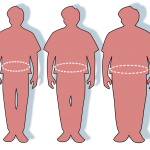 But how do you know if you are obese, and what are the most sensible ways of tackling obesity?